The Victoria line doesn't look a day over 50... but it is. Interchange with: The Lea Valley lines up to Hertford, Harlow, Stansted and Cambridge. Also, since 2005, a useful little cut-through down to Stratford. Also maybe one day, Crossrail 2, but don't get your hopes up. Tile pattern: Edward Bawden did this one. It shows a ferryman hauling a woman across a river, the river being the Lea, and the 'haul' possibly corrupted to 'hale'. There was once a river crossing a little way down Ferry Lane. The woman in the picture is sitting with a dog, a box of chickens and a basket of fruit, like one of those puzzles where you have to get everything across the river without one of the participants eating one of the others. Architecture: No, not really. Externally a fairly ordinary building was attached to the National Rail station via a convenient set of doors. This was fine until the advent of compulsory ticket barriers, and then those convenient doors got shut forcing those wanting to change trains outside the building and sort of down the side a bit and then back in again, improving revenue but wrecking convenience. But this was just an interim measure, and what's coming next is total redevelopment. 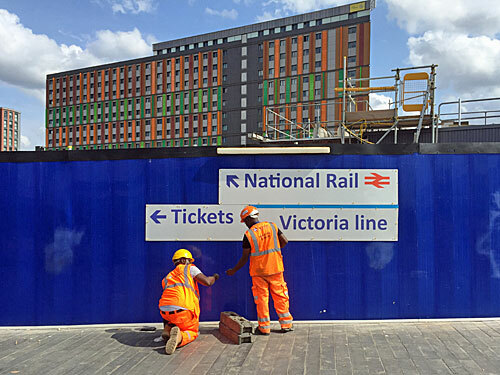 Total development: By summer 2019 an enlarged station entrance will have been completed, in TfL's new favourite 'Enormous Lightbox' style, and including the dreaded words "provision for over-station development". Also expect retail units, in case you can't find enough in the shopping park over the road. While I was visiting I watched two workmen fixing directional signs to some fresh blue hoardings, and wanted to yell "but that's the wrong font" but what good would it have done? Nearby development: Absolutely. Hale Village, across the tracks, is described by some as a "vibrant, sustainable urban village", by others as "little student boxes", and by others as "my god what is that wall of citrus coloured buildings over there?" Just inside: The grumpy souls who work in the station supervisors office have plastered their windows with signs including TICKET OFFICE IS OUTSIDE, THIS IS NOT A TICKET OFFICE, WE DO NOT SELL NEW OYSTER CARDS, TICKETS FOR STANSTED OUTSIDE ON THE RIGHT, PLEASE USE THE TICKET OFFICE AND TICKET MACHINES OUTSIDE, NO TICKETS OR TOP-UPS HERE and BUY YOUR NEW OYSTER CARD FROM THE TICKET OFFICE OUTSIDE, and quite frankly it's enough to make you want to go up to the window and ask for an Oyster Top-up, just to piss them off some more. Ticket hall: There used to be a row of tropical foliage above the top of the escalators, but the jungle's gone, presumably in readiness for redevelopment. 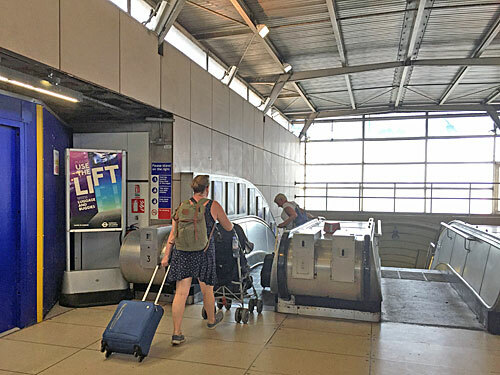 By the top of the escalators is a sign reading 'Use the lift with Luggage and Buggies', but somehow I got held up behind a deliberately-obstinate woman lugging one and pushing the other. Down below: Another typical grey lower concourse stops at a row of doors linking the two platforms. The connecting passage further down feels even greyer. If I try to pretend the tiles are silver, as a nod to futuristic Sixties optimism, I like them a little more. Something to visit nearby: Asda Living, KFC, Wilko, TK Maxx, Greggs, Lidl, Halfords, Argos, Burger King, Food Warehouse, Carphone Warehouse, Subway and many other premium brands at the Tottenham Hale Retail Park. 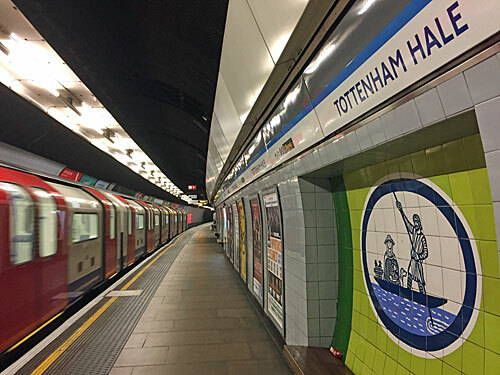 Factnugget: Tottenham Hale is the most northerly station on the Victoria line. Interchange with: The Overground to Enfield/Cheshunt (originally the Stoke Newington & Edmonton Railway). Also an Out of Station Interchange to South Tottenham, although this is unsigned. The tube map is particularly congested around here, which may be why nobody's added this potentially-useful interchange on there either. Tile pattern: This one's by Hans Unger again. It shows seven trees, to represent the circle of seven elms on Page Green which gave the area its name. Their presence is recorded in the 17th century, surrounding an ancient walnut tree which they soon grew to dominate. The elms have been replanted several times, always by seven sisters, but finally disappeared in 1955. A new circle of hornbeams was planted close by in 1997, this time attended by five local families each of seven sisters. Architecture: Hardly. 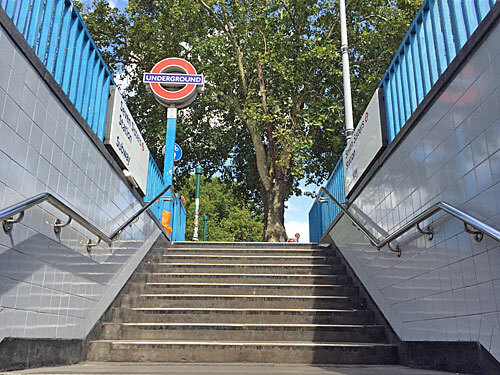 The entrance on the Seven Sisters Road remains a functional funnel, rather than any conceptual statement, while the Victoria line concourse under the High Road is accessed only via roundel-topped staircases. It's not an especially coherent station, let's say that. Nearby development: Suddenly, recently, yes. Haringey's former Customer Services department is transforming into a 23 storey residential tower far taller than anything else hereabouts, which'll be called Apex House when it opens in 2020. It's currently at the liftshaft stage. Ticket hall: Two, neither especially distinguished, each leading via escalator to a different end of the Victoria line platforms. 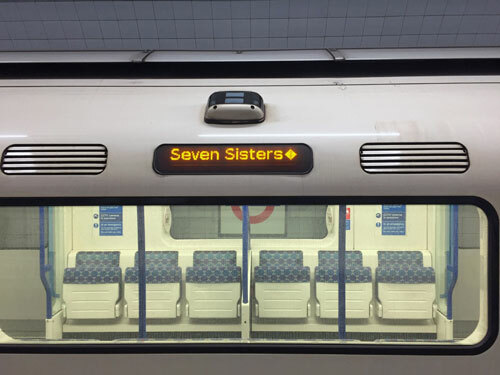 For the Overground you want the Seven Sisters Road end. As part of the retailisation of the Underground, the High Road ticket hall now contains a sparkly new coffee shop called Moloko. If you fancied a dose of single origin El Salvador honey processed coffee, sorry, that was last week only. 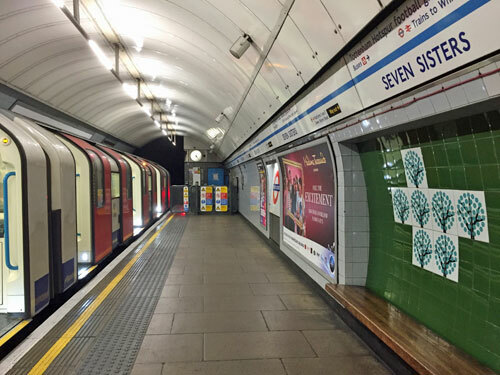 Down below: What's unique about Seven Sisters is that it has three Victoria line platforms. Platform 3 is your usual northbound, and platform 5 your usual southbound, but Platform 4 is only used by terminating trains escaping to head into the above-ground depot at Northumberland Park. You might well alight from a train here, but you're not supposed to go in and wait for one, so I did. Platform-side it all looked quite normal, but the far wall is entirely poster-free, apart from one opposite the entrance which says "Trains do not depart from this platform". The Next Train Indicator alternated between 'Not in Service EMP' and 'Not in Service STF', short for Empty and Staff, to indicate which services drivers and depot staff are allowed to hitch a ride on. Another clue is the diamond symbol which appears on the train's destination displays. As a diamond geezer I was particularly intrigued by this, but a train driver soon emerged and seemed keen to shoo me off the platform because there was nothing for me here. 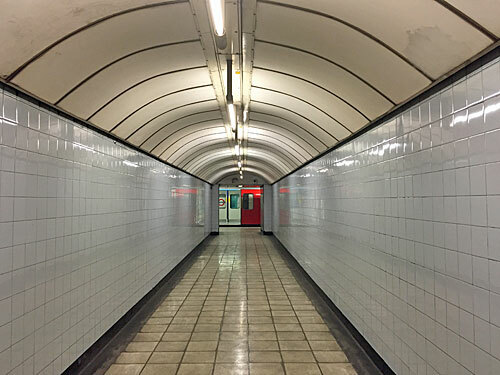 London Reconnections has the full story of secret, hidden platform 4. Something to visit nearby: El Pueblito Paisais, Tottenham's very own Latin American market, is an astonishing warren of 40-or-so crammed-in traders and utterly authentic. Come for cuisine, fashion or butchery, join families hanging out, mind the small children rampaging past, and delight that such a place still exists. It won't for much longer, if the developers get their way, and although the traders have been promised pitches elsewhere during reconstruction it's not likely many will make it back. As is increasingly the case, commercial uplift trumps community amenity. 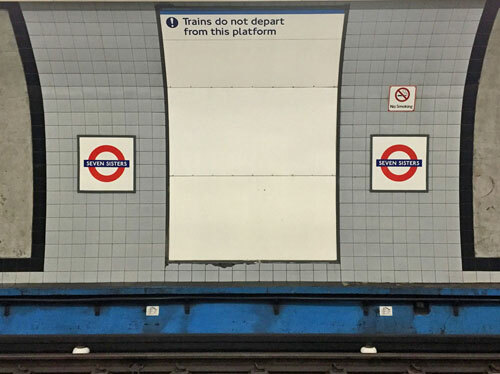 Factnugget: The Victoria line was closed between Seven Sisters and Walthamstow Central for two months in summer 2015, as the lumpy rectangular residue on every in-carriage line diagram still reminds us. Some photos: Seven, obviously, here. 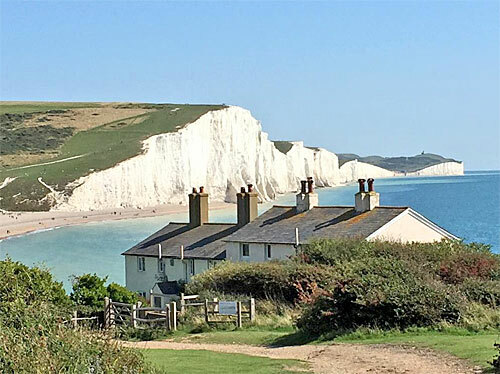 I spent the Victoria line's 50th anniversary admiring the wrong Seven Sisters, sorry.